Medium slightly brownish yellow, emerald radiant-cut 67.85-ct barite, 28.1 x 17 mm, Madagascar. © The Gem Trader. Used with permission. Massive white barite (also called known as baryte) looks like marble and could be used for decorative purposes. In spite of the abundance of good crystals, cut barites aren’t commonly seen, especially in rich colors. Colors Colorless, white, grayish, yellowish to brown, blue, green, reddish. May be color zoned. Crystallography Orthorhombic. Tabular crystals, aggregates and rosettes; massive, granular, fibrous, earthy, stalactitic. 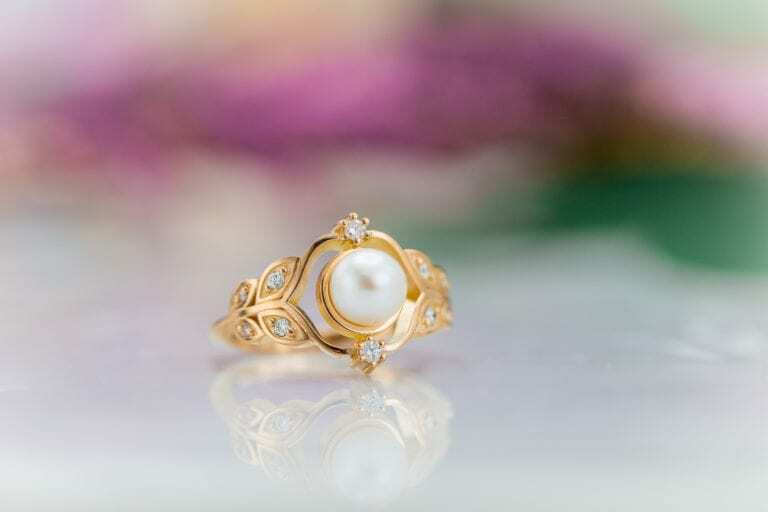 Luster Vitreous to resinous; pearly on cleavage. Luminescence See “Identifying Characteristics” below. α = 1.636; β = 1.637; γ = 1.648. Biaxial (+), 2V = 37°. From the Greek baros, “heavy,” because of its high specific gravity. Barite is common in low temperature hydrothermal vein deposits; also as a component of sedimentary rocks, sometimes in large beds; as concretions, in clay deposits, and rarely in cavities in igneous rocks. Good crystals abundant worldwide. 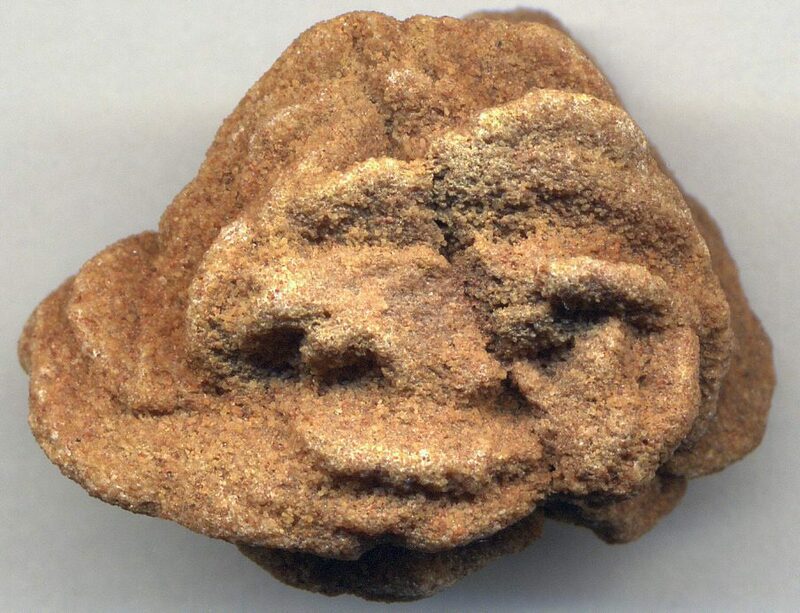 Barite: South Dakota (4.7), Colorado (9.4, 9.1). Photo © Joel E. Arem, PhD, FGA. Used with permission. Crystal barites aren’t rare. 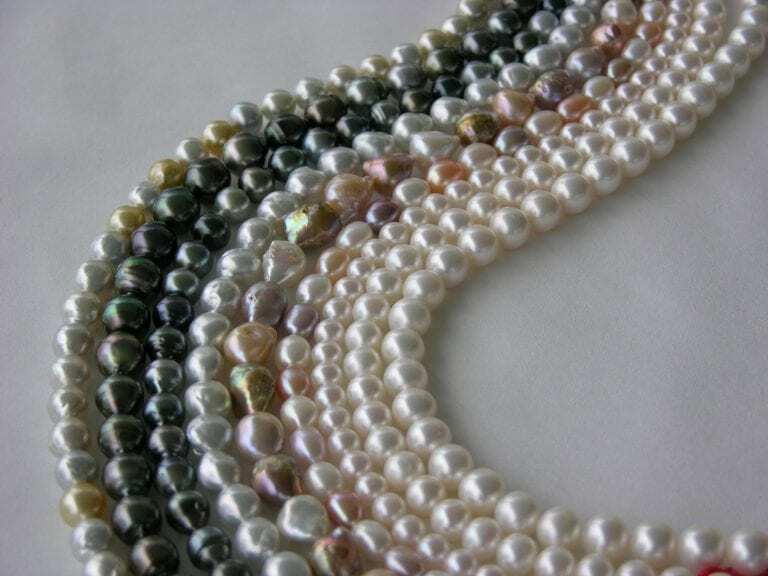 In fact, collectors can obtain large, transparent stones in almost any desired color with very few exceptions. 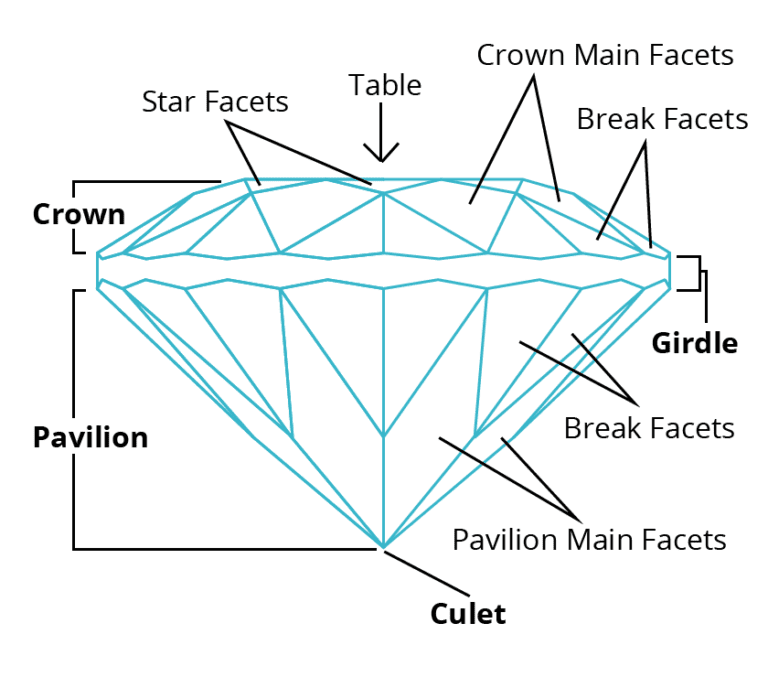 However, gem cutters will find faceting barite quite challenging. These gems have low hardness (3-3.5), brittle tenacity, perfect cleavage, and heat sensitivity. Facet junctions on any cut gems also tend to be rounded. 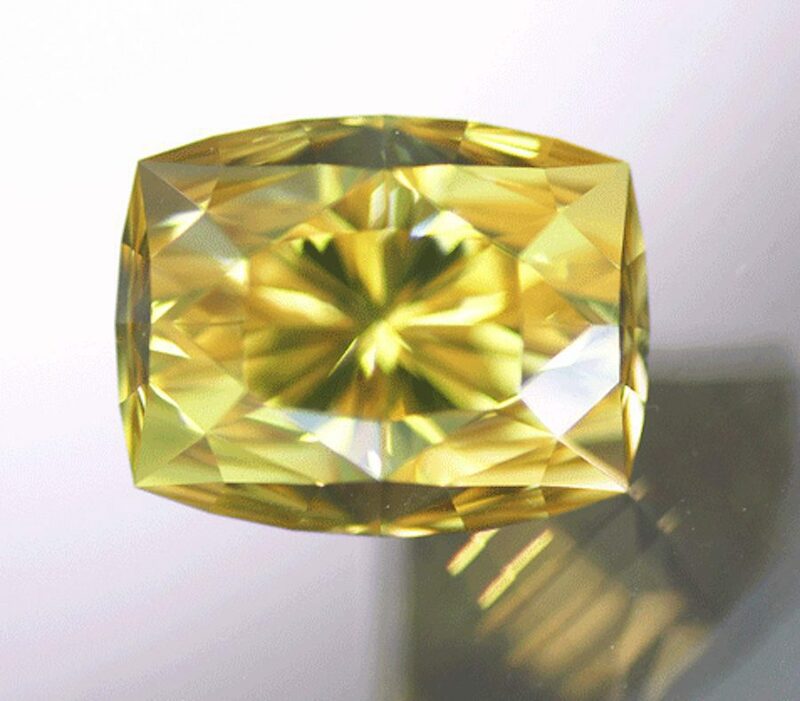 This yellow barite gem has received not only an expert cut but also an exceptional polish. Polishing such a soft material to this level is very difficult. 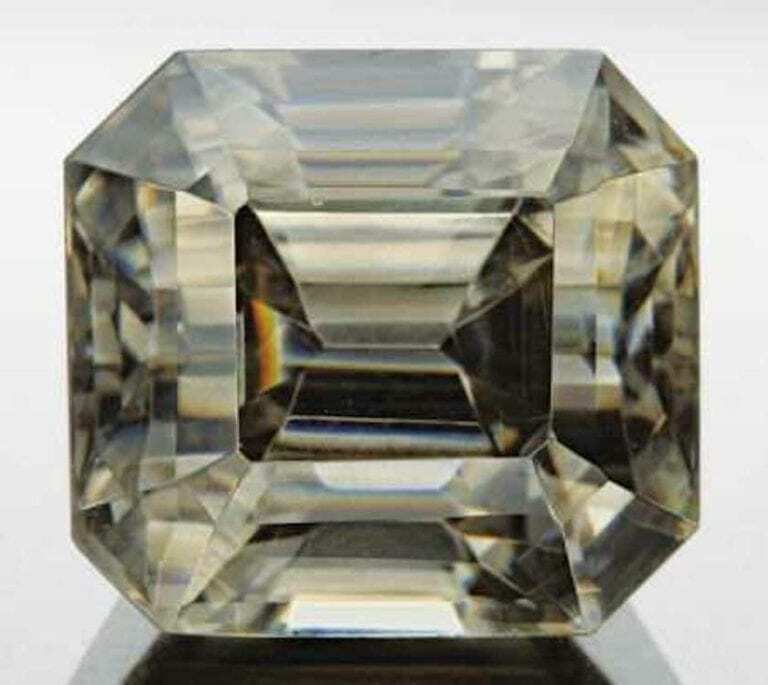 Cushion cut, 32.95 cts, 16.8 x 13.3 mm, Sardinia, Italy. © The Gem Trader. Used with permission. In desert regions, minerals such as gypsum and barite can occur as tabular crystals with rose-like shapes. (The crystals form the petals of the rose, so to speak). These stones contain trapped sand particles. Barite rose from Oklahoma, USA (2.8 cm across at its widest). Photo by James St. John. Licensed under CC By 2.0. Barite’s relatively high specific gravity (SG) of 4.3 to 4.6 can help distinguish it from many other gems of similar appearance. 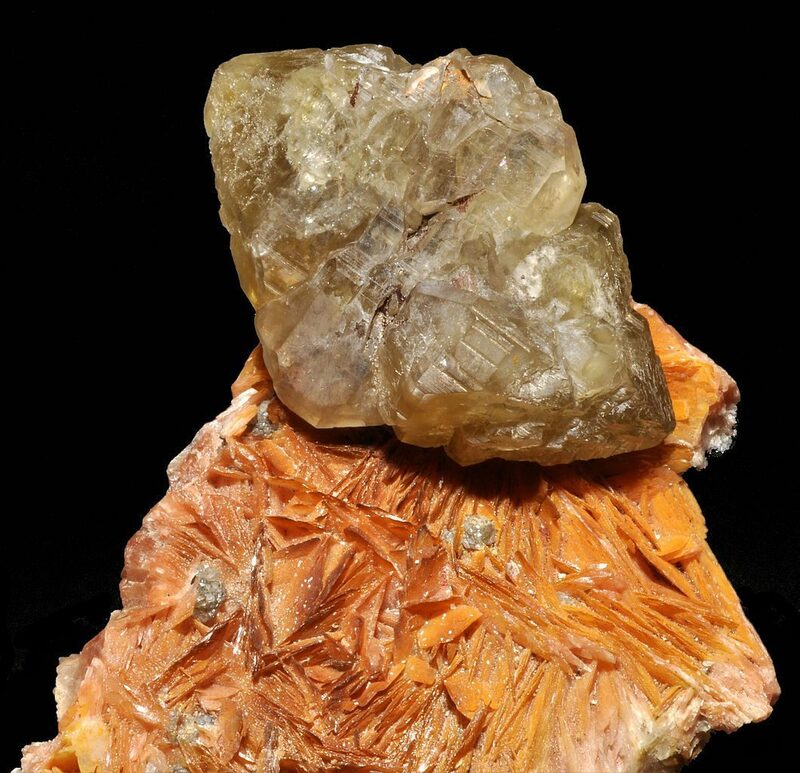 Barite is also diamagnetic. An externally applied magnetic field will repel it. Colored barite crystals can display weak pleochroism. Brown crystal: straw yellow/wine yellow/violet. Generally, inert to cream, bluish, or greenish in longwave (LW) ultraviolet light. Barites may also phosphoresce, and some may show thermoluminescence, which means they luminesce when heated. 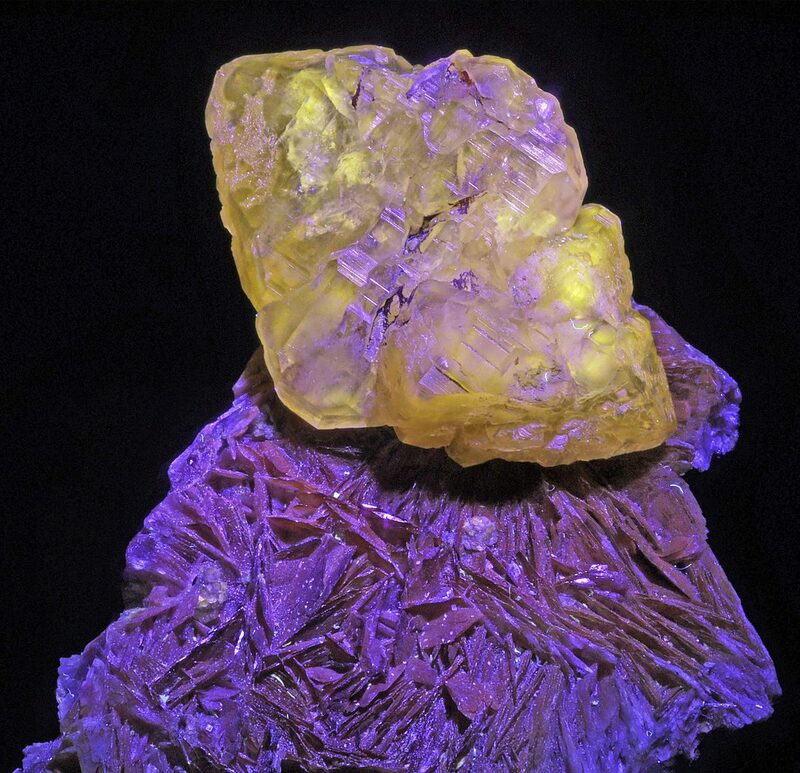 Cerussite and baryte under white light and ultraviolet longwave. Bou Bekker, Touissit, Touissit District, Oujda-Angad Province, Oriental Region, Morocco. Photos by Géry Parent. Licensed under CC By-SA 3.0. 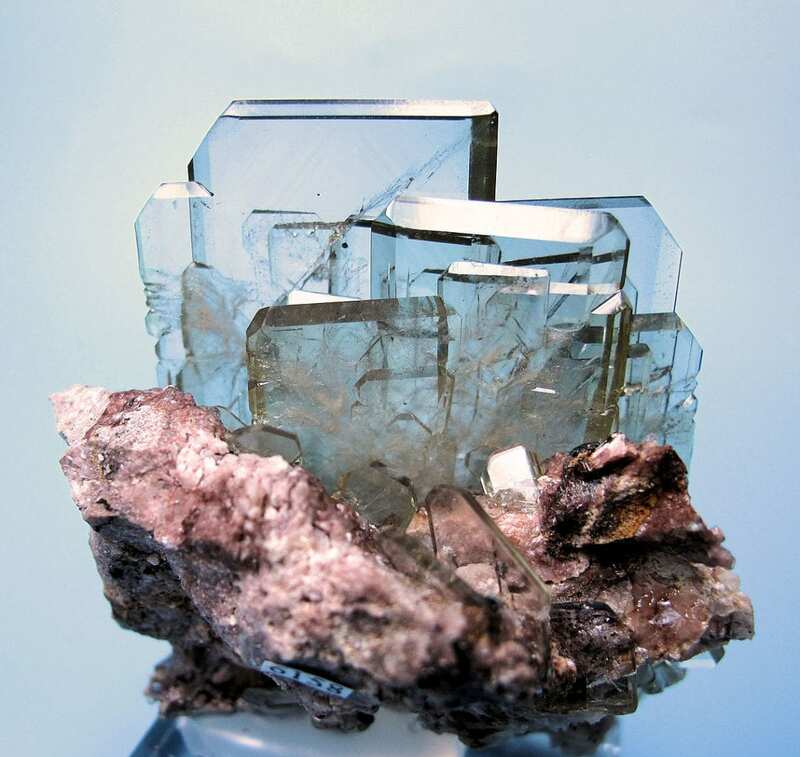 Scientists have synthesized barite crystals for mineralogical research purposes. However, such synthetic material has no known jewelry use. Cluster of transparent, almost colorless tabular barite crystals on matrix. Overall size: 56 mm x 53 mm. 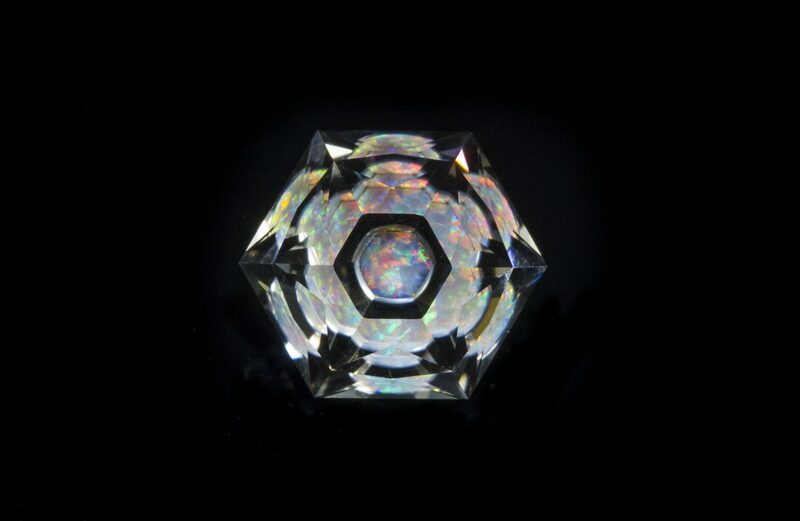 Major crystal: 22 mm wide, 3 mm thick. Cerro Warihuyn (Huarihuyn), Miraflores, Huamalies Province, Huanuco Department, Peru. Photo by Carlesmillan. Licensed under CC By-SA 3.0. United States: Sterling area, Colorado (exquisite blue crystals, some facetable); Illinois; Meade County, South Dakota (fine brown crystals, facetable). Canada: Rock Candy Mine, British Columbia (facetable yellow crystals, up to 4 inches long); Thunder Bay District, Ontario (colorless crystals suitable for cutting). United Kingdom: Cumberland, England (fine crystals, sometimes very large, facetable areas). Brazil; China; France; Germany; Italy; Morocco; Namibia; Peru; Russia. Medium dark brown-yellow, custom cushion-cut 14.82-ct barite, 18.3 x 11 mm, Elk Creek, Meade County, South Dakota. © The Gem Trader. Used with permission. Large crystals, usually flawed, have many facetable areas. English material will yield stones up to about 50 carats. (One specimen is known to be over 300 carats). 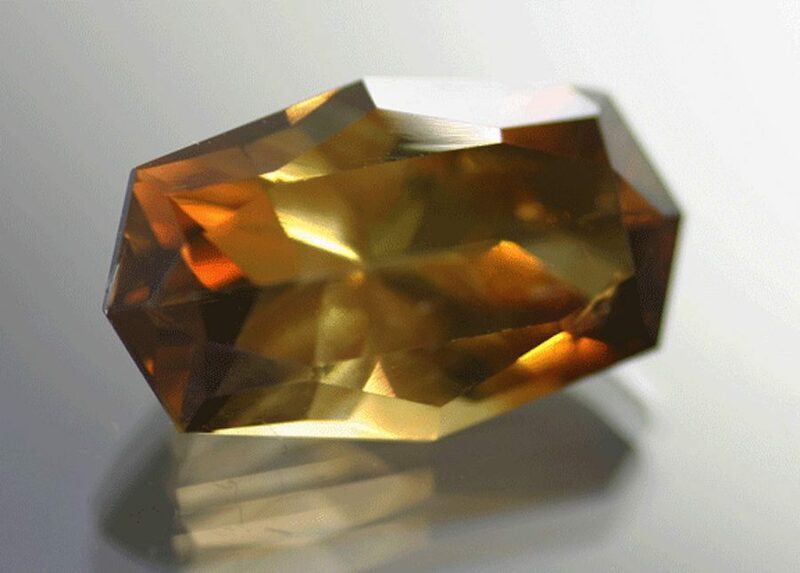 Faceters have cut yellow-brown crystals from France as large as 65 carats. Colorado gems range from 1 to 5 carats. 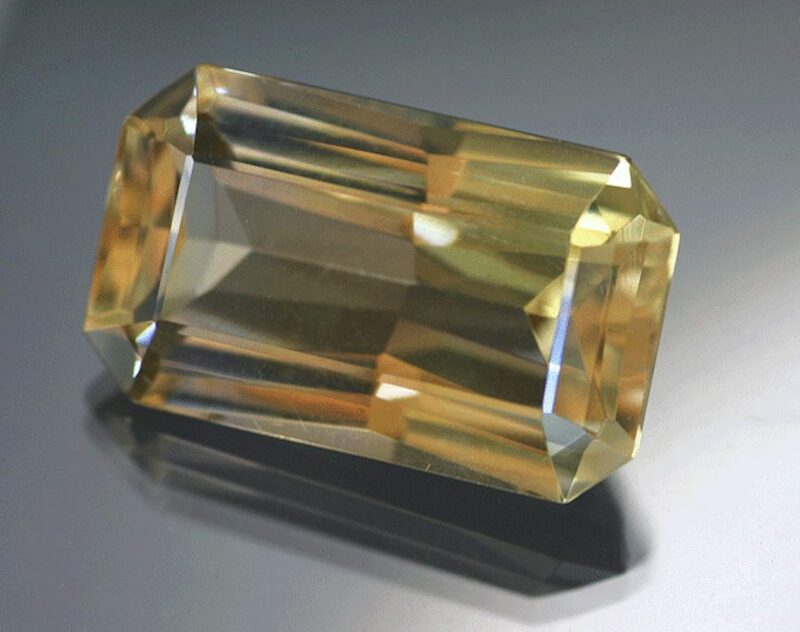 A 42-ct golden-orange, cushion-cut gem (British Columbia). A 108-ct dark brown, oval-cut gem (South Dakota). 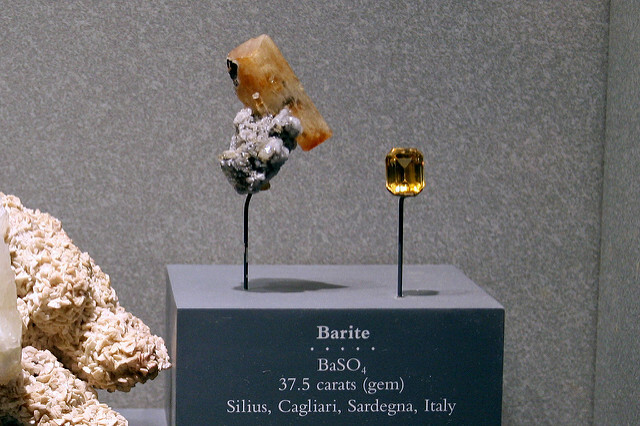 Due to barite’s fragility, jewelry use isn’t advisable. 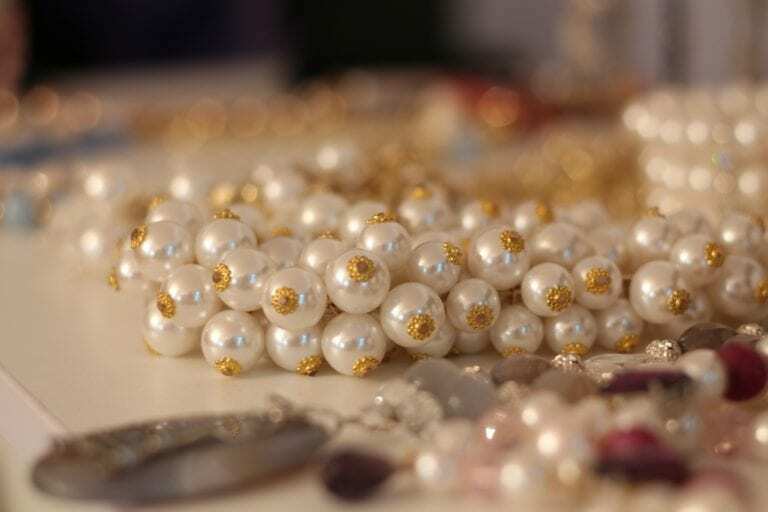 Clean these gems only with a warm damp cloth, detergent, and soft brush. For more care recommendations, consult our gemstone jewelry cleaning guide. Barite crystal and faceted gem. Photo by Cliff. Licensed under CC By 2.0.